John Baines is a tutor on the MSc Education for Sustainability. He is a consultant in sustainable development, education and training. 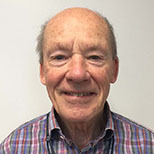 He has been Director of the Council for Environmental Education, and has represented UK government and NGOs at national and international events. John was awarded the MBE for services to environmental education in 1988. He is Vice President of the Institution of Environmental Sciences. He has a special interest in sustainability education and training for professionals, both pre- and in-service. John Baines trained as a geography teacher. He taught in Tanzania and was Head of Geography at Rickmansworth School. He was also an Education Officer at the Commonwealth Institute. As an independent consultant in education and training for sustainability John has developed, produced and delivered training courses for professionals around the world. Customers have included government education departments, teachers, business and industry. He has run projects for the British Council, European Union, World Conservation Union and the Council of Europe.